Devenir’s quarterly credit union HSA update finds over $1.62 billion in HSA deposits were held in credit unions as of 12/31/2018. 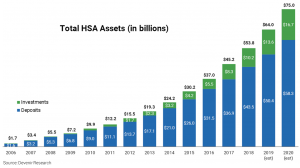 Findings from the 2018 Year-End Devenir HSA Market Research Report containing health savings account (HSA) market statistics as of December 31st, 2018. Devenir’s quarterly credit union HSA update finds over $1.59 billion in HSA deposits were held in credit unions as of 9/30/2018. Devenir’s quarterly credit union HSA update finds almost $1.59 billion in HSA deposits were held in credit unions as of 6/30/2018. Findings from the 2018 Midyear Devenir HSA Market Research Report containing health savings account (HSA) market statistics as of June 30th, 2018. We are continually gathering HSA & CDH research for our database and have run into some great research done by others. These are some of the resources we routinely keep an eye on.